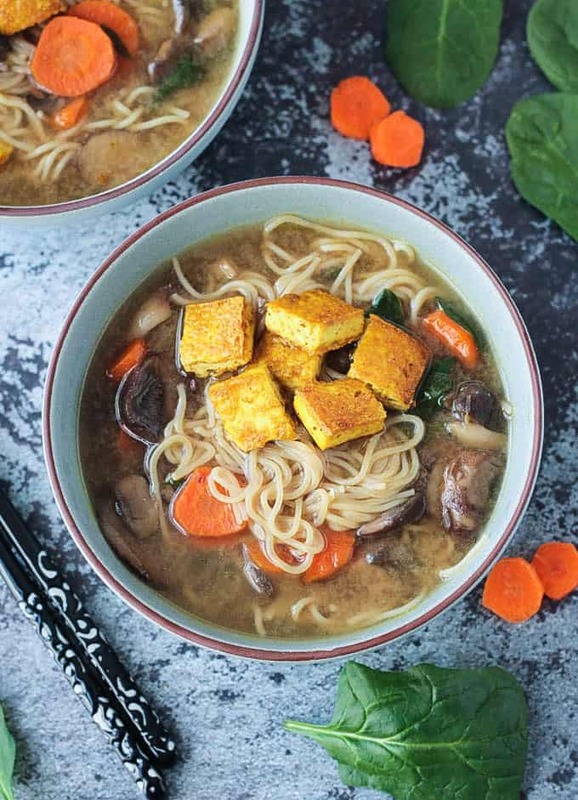 Soothing Mushroom Ramen Soup with Crispy Tofu from The Veginner’s Cookbook: The Ultimate Starter Guide for New Vegans and the Veg-Curious by Bianca Haun & Sascha Naderer. 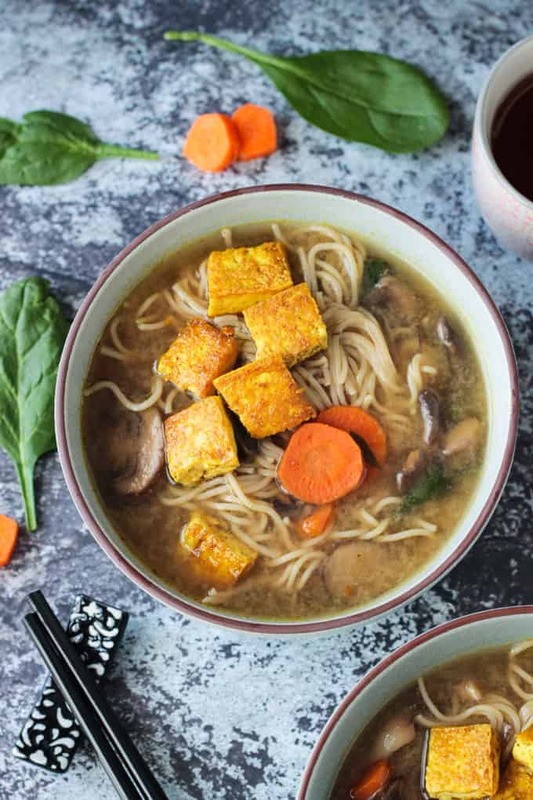 This Soothing Mushroom Ramen Soup with Crispy Tofu is a rich and deeply flavored Asian-style soup that takes just 30 minutes. The crispy tofu is amazing! Total comfort food! And it’s just one of the yummy recipes you’ll find in the new cookbook, The Veginner’s Cookbook. 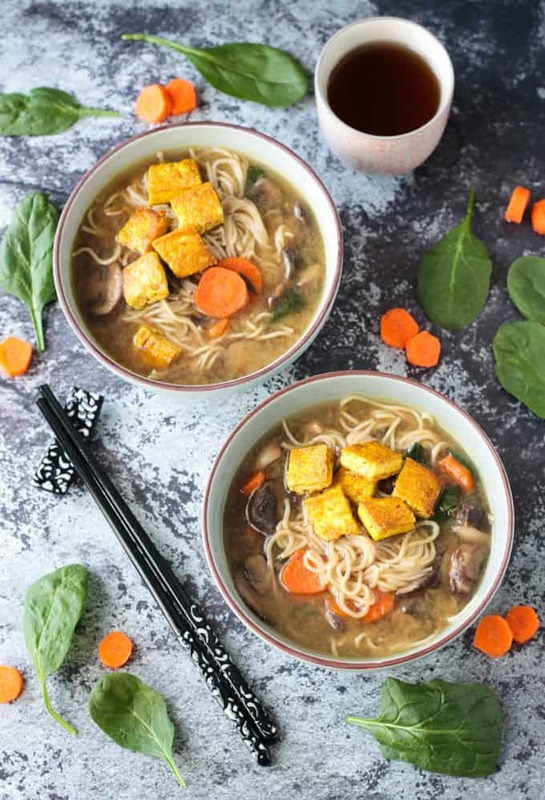 Get my full review of the book, the recipe for this Ramen Soup, and Enter for a Chance to Win your very own copy below! I’m excited to share The Veginner’s Cookbook with you today. 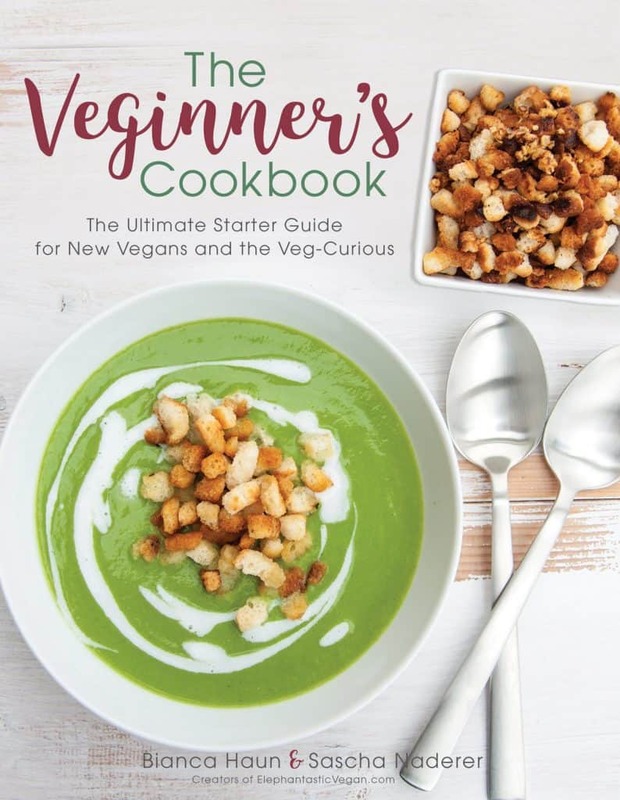 It’s perfect for new vegans, vegan curious, and those looking for simple and delicious vegan recipes. 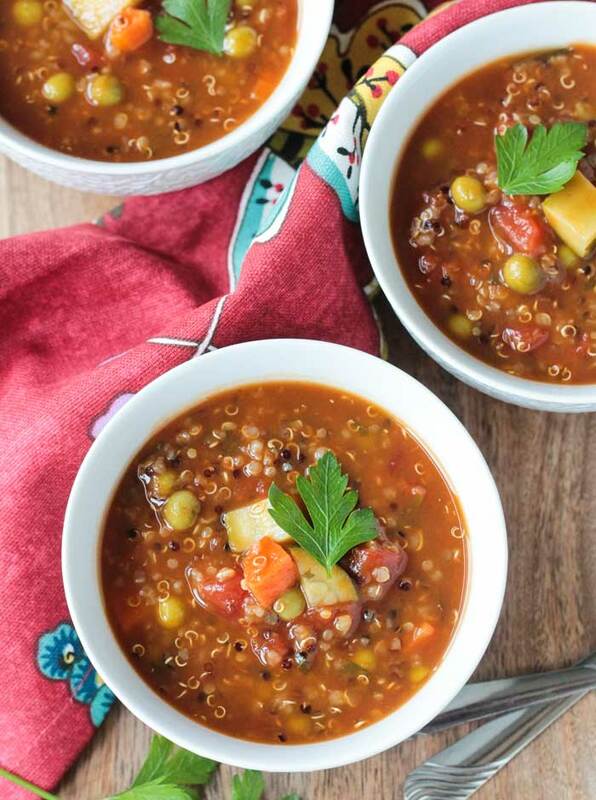 This book proves that a vegan diet doesn’t have to be intimidating or expensive. 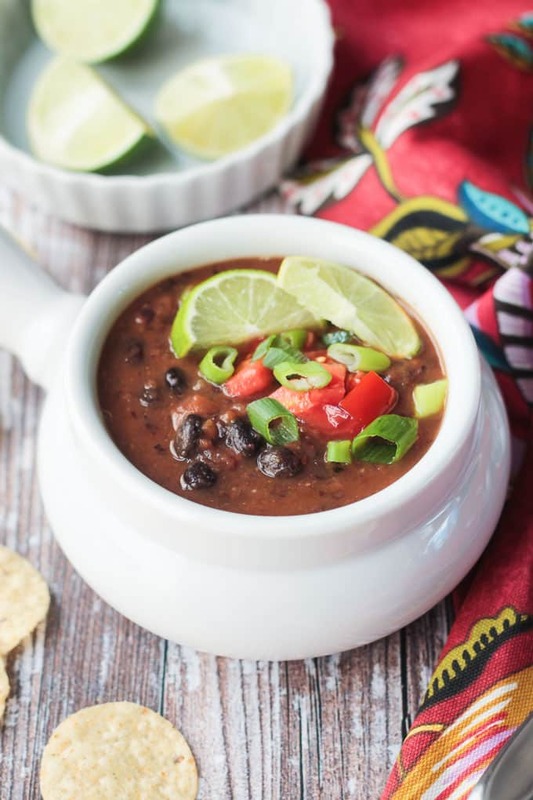 You may know Bianca Haun from her blog, Elephantastic Vegan, where she shares her favorite plant based recipes. Her blog even has a section called Veginners, which focuses on topics for new vegans. This book was the obvious next step for her. She wrote it with her boyfriend, Sascha Naderer, who loves cooking, and of course, eating all the delicious vegan food as well. Copyright 2018 by Bianca Haun and Sascha Naderer. Reprinted with permission from Bianca Haun, Sascha Naderer, and Skyhorse Publishing. The book is broken down into two parts. 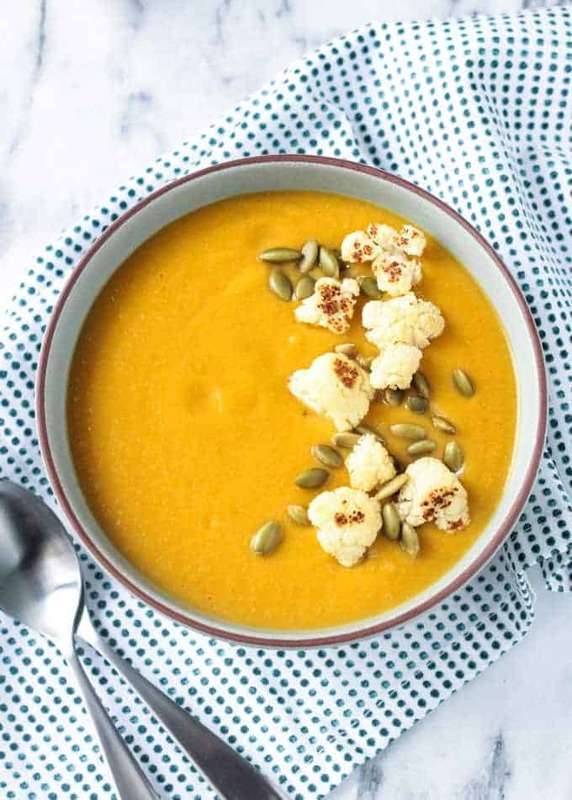 Part 1 includes tips and advice on vegan substitutions for your favorites, like eggs, butter, milk, cheese, and more; how to cook grains; basic kitchen equipment and ingredients; and what to say to skeptics. I am in love with this crispy tofu! Bianca features this tofu on her blog in her BBQ Couscous Bowl and I’ve been eating tofu this way ever since I first discovered that recipe. It’s seriously the best. And it works wonderfully in this ramen soup recipe as well. Though, I must admit, only half of it made it to the soup because I kept popping them into my mouth straight from the skillet. I hope you love this Mushroom Ramen Soup as much as I do. If you try it, please come back and leave me a comment below with your feedback and star rating. Don’t forget to enter the giveaway below to win a copy of the book. The book is available for purchase on Amazon or Barnes & Noble (as well as in stores). Bianca and Sascha say, "After exhausting days at work, there's only one option that brings us back all the comfort in the world: soup. 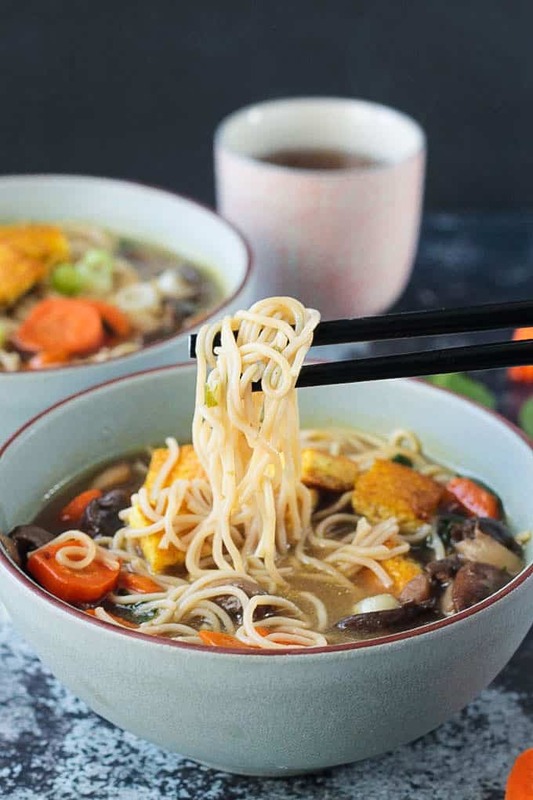 This is why we came up with this Asian-style mushroom ramen soup. We love the combination of spinach and mushrooms!" In a large pot with sesame oil, add in the sliced mushrooms, carrot, and scallion. Add soy sauce and let it cook until the mushrooms have lost most of their water. Then, add in the spinach, water, and 1 tablespoon miso paste. Give it a good mix, and let it cook for about 5 to 10 minutes until the carrots are soft. Set aside. Meanwhile, heat a large pan with the canola oil and season it with the salt and curry powder. Tilt the pan until spices and oil are combined, then add the tofu slices. Cook on medium to high heat for about 8 to 10 minutes until golden brown on one side, then flip and repeat. Add the ramen noodles into the soup for a few minutes until soft. Add more miso paste and soy sauce to taste. Once the ramen noodles are soft, pour the soup into bowls, add the pan-roasted tofu, and top with a few freshly cut scallions. ~Veggie Inspired Notes: I used coconut aminos instead of soy sauce. You could also use tamari if you have that. I used avocado oil in place of the canola oil. And I pressed my tofu before slicing into bite size pieces. I would love to try out new recipes. This looks yummy! I’ve been craving ramen and recently bought a curry powder, so now I have a new recipe to try making! Whoo hoo! Perfect – I think you’ll you love this one! The ramen soup looks amazing! Thank you. As a gluten free vegan, I think I may try and substitute zucchini noodles for the ramen- any advice ? I haven’t tried anything past spiralizing and sauteeing my zoodles. Great idea, Jill. I would add the zucchini noodles to individual bowls right before serving. That way they would still maintain a bit of a crunch…which is how I like them best. Enjoy! Have you tried rice noodles? I’m also a gluten-free vegan and I use brown rice pad thai noodles (Annie Chun) for pasta dishes. I think they’d work for this, too. Looking forward to trying this soup. I haven’t, but I think they would work great! Me too, Jeannie! I’m obsessed with cookbooks and read them start to finish when I first get them. So fun! Good luck! Looks amazing! I’m going to try this out tomorrow for dinner, but leave out the oil. I can’t wait to check out the cookbook! Let me know what you think after you make it. Enjoy! Exactly! Simply, but totally delicious! What excites me is the recipes! Everything looks delicious. What excites me most about this book is the combo of providing simple basics (whoo hoo: vegan cheese sauce!) mixed with really yummy sounding recipes (can’t wait to make this ramen and the avocado pasta). Who could resist vegan cheese sauce?! So good! Looks like recipes we all could enjoy! For sure! Good luck, Angie! I think what excites me most is the wide range and types of recipes! All of her recipes are great! This book sounds wonderful to learn the basics and getting down a few recipes that you can use over again. I’m excited for the cheese sauce and BBQ sauce with dates! Yes, you will definitely reach for this one over and over. Good luck! Are there any substitutions for the oil when searing the tofu with the curry powder? Looks tasty, but I avoid oil. What looks most appealing about this cookbook is the accessibility of the recipes. Just the right balance between full flavors and basic food. Yes, it really is! You’ll love it! Wohoo! Thank you so much for the awesome review, Jenn! I’m making a mushroom ramen soup almost once a week in the cold winter months. It makes me feel immediately better and warms the body from the inside 🙂 So glad you like it too! You are so welcome, Bianca! We are really enjoying your book!